A sometimes funny, sometimes irreverent Q&A book about training horses by learning what the animal has to teach the trainer. While there is no one fits all method of training a horse, if the trainer approaches with an open mind and sensitivity toward animals, in this case horses, the horse can teach the trainer how the horse wishes training from the trainer. When working with something as large and heavy as a horse, it might be a good thing to listen what to what the horse is willing to teach the trainer about the proper method for building a bond between horse and trainer. The tack used and method of training for a particular horse will need to be worked out between animal and human for there to be the proper level of trust built between the two. For training to commence and have a good outcome for both and so that riders will have a good horse for their riding pleasure. While some of what is in the book may seem to be common sense, it is the horses common sense that trainers need to worry about, connect to, and let the horse tell the trainer what works best for each individual trainer. This reviewer found Equiknowlogy 101 to be a fun and informative read. If the reader is looking for how to train their horse or looking for a trainer, Equiknowlogy 101 will give you some basic information on how to train, or what to look for. When training a horse, the trainer will learn many things from a horse, one being patience. If the person training does not have patience when they begin, they will by the time the horse if trained. Equiknowlogy 101 is a recommended 4 out of 5 stars read for anyone thinking of acquiring a horse or becoming a horse trainer because they love being around horses and love riding horses. A speical offer for my friends!!! I told you that I was going to make a special offer to my friends as part of the release of my new book Equiknowlogy 101… so here ya go! For a very limited time you can get your study material for your PHD and FHD at half price! Be one step ahead of your class by taking me up on this great offer! If you go to my web site and purchase my Horse buying guide DVD, “You Can’t Ride Pretty” I will send you the text book Whisper This… FREE! I know you want to be at the head of your class when Equiknowlogy 101… comes out so don’t get left behind by not getting the study material for your first two degrees now! Supplies are limited for this offer so don’t wait… It won’t last long. I hope your having a great summer and it’s back to the round pen for me! Oh one more thing… I have put up a new business page on face book. You can get to it through my regular page.. On there is a short video clip from my just released DVD “Colt Starting 101… Raw and Uncut” check it out! Colt Starting 101… A new DVD series is available now!!! 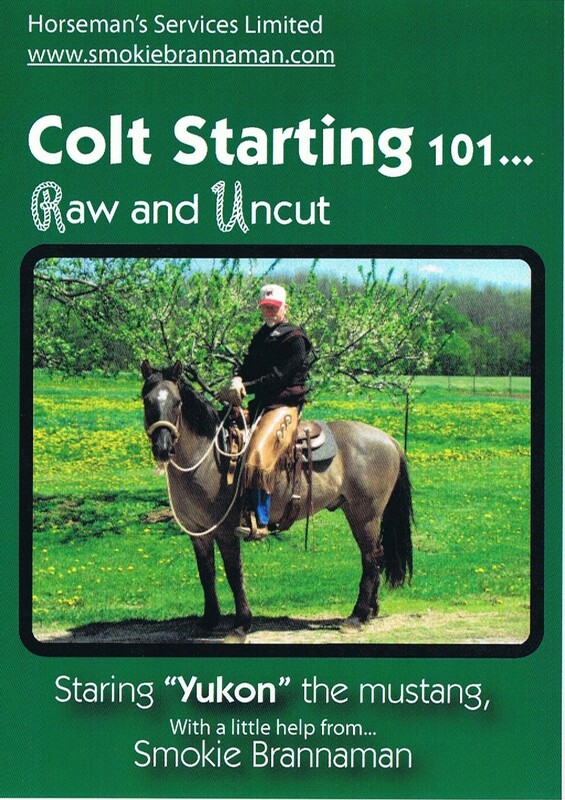 My new 6 disc DVD series Colt Starting 101… Raw and Uncut is now available for sale! In this series we filmed the starting under saddle of Yukon the 5 yer old Mustang from day one thru day 12 and his first ride out side. As I have said in my earlier posts this video series will give you more training information on starting colts or working with any horse for that matter, than any and all single training videos combined! And at cost of just under 8 bucks per DVD $39.95, how can you go wrong? Take a look at the boxed sets of training videos from the big guys.. You will be paying 100s of dollars for the same education that I will teach you in this series. More info on this great new DVD series will be up on the web site shortly with a pay pal purchase option and at Amazon to. UPDATE!!!! Colt Starting 101… can be purchased now at Amazon.com! I’m telling you, I don’t think you will be disappointed with this video. But if you are… Well you can always go pay 500 bucks to out back jack and see if you learn any more from his! Don’t wait get yours today! Please check out my companion website I just put up at: http://www.equinetraining101.com I will be adding to it from time to time as well but for now it is my first attempt at making one. It might become the home for the Whisper This… College of Equiknowlogy, we shall see! Well our new book Equiknowlogy 101… is at the printers going through the final reviews before printing! I am really charged up about this new book and I hope that you all will enjoy it! Look for it on my site hopefully next month. Also I should have the colt starting video series on the site in short order as well. I will tell you that this DVD series is a boxed set of 6 DVDs taking you from day one on Yukon’s starting, on through his first ride outside on day 12 showing you everything we did together from round pen work, to ground work, saddling, the first ride and more! I looked at other videos from the other noted trainers and clinicians and I think you will appreciate this one as much or more.. Not only because it shows you the hows and whys of starting a colt, or working with other horses, but for what is not in it.. Music, special effects, and perfect movie quality.. Because this is how it’s like in the real world of training not how it’s like in the studio. Not only that, those famous folks have lots of bucks wrapped up in those fancy covers, editing and production, so their price reflects that. The ones I looked at range from $150.00 to well over $800.00 for multiple DVDs. With this one I will give you the same education without the special effects for less than a hundred bucks! WAY LESS! Sound good to you? Drop my a line if you want to be one of the first ones to get this set.. Right now it looks like I will be making these one at a time to hold my cost down and the cost to you. So if you want one get on the list or you might have to wait awhile! That’s it for now friends so Best wishes to you and “Just Ride”! Well it looks like spring is finally here and things are getting busy.. I just wanted to drop you a quick note on whats coming up in the next few months.. Next month on the 1st of May I will be at the Silver Spur tack shop in Plymouth WI doing a round pen and ground work demo so drop by and say howdy.. There’s lots of great stuff on sale too! And my new book Equiknowlogy 101… is being edited and should be ready to go to the printer soon! Look for it on my site in the next few months.. Also I have been working on a colt starting video series staring “Yukon” the mustang.. This video will be a raw and uncut video of what it took to start this colt from day one up to his first ride outside.. It shows each days lesson and how he progressed through the starting process over a two week period.. This video will not be a Hollywood production complete with music and choreography! But it will show the true life realities of starting a horse, how it was done and what you could expect if you try it yourself.. Complete with chickens running through the round pen, dogs barking, birds flying around the arena, gates clanking and all the rest of the things you and your colt will deal with when your working with him..I will have a copy of the working vids at Plymouth if you care to come down and see what ya think..
And now that spring is almost here I know some of you will be looking for that new horse.. Before you do might I suggest taking a look at “You Can’t Ride Pretty” A complete horse buyers guide.. A 2 DVD set giving you all the info you will need to find that perfect equine partner! I have also lowered the price to just $25.00 for this very beneficial educational tool. So don’t wait get it before you spend a ton of bucks on the wrong horse..So that’s what coming up friends. I hope you are getting some saddle time on your horses and things on your spread are shaping up to be a good summer! Drop me a line and say hello and we will see ya down the trail! Some random words of thought.. Through the years, Ive come to realize that the keys to being good with horses does not lie entirely in the sums of acquired knowledge of training principals, or the tutelage received from the all knowing masters of horse training. The keys to obtaining the level of wisdom and to truly be one with the horse come from the deepest darkest parts of your sole and your experiences in life. It is how you see, interact, and judge, your self, your horse, and others, against the perceived realities of the world around you. And how you manage the turmoil within yourself. This is how the horse will see you, respond, and work, (or not work) for you. Horses are remarkable creatures in that they can look into the eyes of you, The predator and instantly know if they can trust you with their life. They will not prejudge or hold a grudge if they cannot. They will willingly accept you as the leader if you have their respect and their confidence as the protector of the herd, their life, and their existence on this earth. People that have not had or lived through a profound life changing or emotional experience and know the true meaning of what life is all about, cannot become true horsemen. If you do not know, or havent seen your life for how truly simple it is, and cannot give a part yourself, or your knowledge, without judgment, for the betterment of the others in the heard, you cannot appreciate or comprehend what it takes to really know the horse. Ive talked with horseman and women that truly have a gift with horses. Virtually all are at peace with themselves and all creatures, including the rest of the bipeds. All have witnessed and faced death, the miracle of life, and they know that it all can change in an instant. One bad kick, bad argument, bad war, relationship, or decision made for some self-serving mission or concept of reality. The only two perfect unchanging concepts of emotion and human reality, living and dieing. These two concepts manifest themselves in the horse as forgiveness and fear. Trainers or horse people that base their training on other human concepts will not succeed in training or horsemanship. If they cannot accept and let go of their distrust, anger, jealousy, control, and preconceived ideas of life, love, sacrifice, time, and how we live life on this earth, they will never know or experience a true willing partnership with the horse or the humans in their lives. Learn to forgive yourself, your horse, and others for their imperfections. Do not fear yesterday or tomorrow. Or get balled up over those things that you cannot change, were unsuccessful, needs more work, or simply forgotten. Just be patient, and live for today, the best way you can. Be in harmony with yourself, your horse, and the others you share your life with. Have no regrets, and expect no more in return. Im not a true horseman yet but I work on it every day and I hope this helps you along the way. Here is a letter I received from Steve DePriest in Colorado. It is interesting in the fact that it truly typifies why I wrote “Whisper This…” and my hope to help people become more educated and safer horse enthusieist. Here ya go! You don’t know me but I feel like I know you. I’ve just got finished with your book and enjoyed it VERY much. I’ve also read your brothers books and took some of his clinics over the years. I am the quiet fellow in Bucks’ book “Believe”, pages 11-12. I owe you many thanks for your book, especially pages 6-10. I got crushed by one of those colts who had the misfortune to have a dingbat mother and a rattlesnake daddy. I was foolish and believed that there was no such thing as a bad horse. Whoops! Thank you so much for explaining it to me in plain english. Thank you, Thank you, etc,etc,etc! I hope you have another book in you. I am waitiing for your next one with bated breath. Or worms on my tongue! A letter from my new friend Michael Martin Murphy!! Here's a letter I recieved from my new friend Micheal Martin Murphy. A great singer and fellow horseman. Love that song "Wildfire"
stuff gets a little too weird for this cowboy! Freeman in Texas, and has huge talent as cutting horse competitor. ranch- and she loves them all. can get to know each other as time goes on. A letter I thought you would like to read..
four horses will have something to chew on this winter. following the advice in your book. the sore muscles and bruised toes. dispositions. And yes, Ive been kicked, bit, stomped and run over a few times. Thanks God no serious injuries. after they have a mouth full of dirt or a hoof print on their back? have been trimming part-time for five years. thinking about buying a horse.